With a growing number of subscribers willing to pay higher monthly rates, Sirius XM has cash to burn. But it's how it plans to use that cash that matters to investors. A combination of strong cash flow and favorable conditions for debt restructuring could end up being a boon for long-term Sirius XM (NASDAQ:SIRI) investors. It gives Sirius the ability to return cash to shareholders while maintaining flexibility to invest in the company's content, strengthening its position in a market getting crowded with music-streaming services like Pandora (NYSE:P) and Apple's iRadio/Beats Music service. Sirius has been capitalizing on its improved financial condition and favorable interest rate environment to retire old debt and borrow at lower rates. The immediate result of the refinancing is more cash in hand – not so different from when you refinanced your mortgage to a lower interest rate. But it's how Sirius plans to employ that cash that really matters. Unlike dividends, where the yield provides a quick assessment of the return in value to shareholders, share buybacks can't be easily measured, and there's plenty of debate about how effective they really are. The move takes outstanding shares out of circulation, which theoretically increases the value of each share still available. But buybacks can also be overused. If a company is overzealous with buybacks, it could end up spending cash that would have been be more wisely allocated to investing in its business. 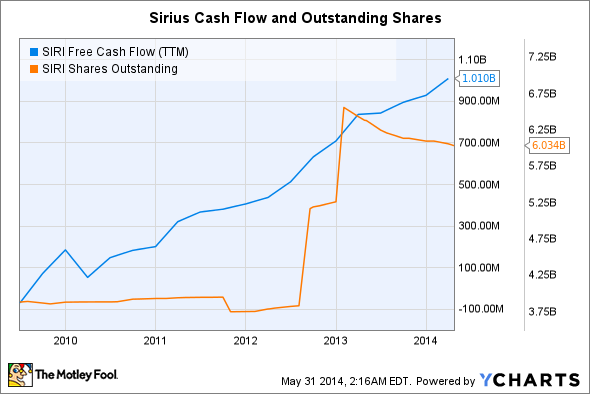 Sirius still has many outstanding shares, so the buybacks make sense. What's more, CEO Jim Meyer seemed to be exercising caution over the buybacks when he addressed an analyst's questions during last month's earnings conference call. The analyst, Barton Crockett of FBR Capital Markets, noted that Sirius could increase its leverage considerably to either increase buybacks or offer a dividend. "We care about how we use the shareholders' money. We think we'll be smart with how we do that once we get through that authorization, we'll have a discussion with the board and consider what we might want to do in the future." Sirius has a steady stream of subscription revenue. It has a growing number of subscribers – 25.8 million at the end of the last reported quarter. And those subscribers are willing to pay higher prices, as demonstrated by the more-than-expected addition of 267,000 subscribers in the first quarter, the first reporting period since Sirius XM jacked up its monthly rate by $0.50. It also has relatively low operating costs, since most of its infrastructure is already in place. It will occasionally have to add a new satellite. And it will have to deal with increasing royalty rates in this super-competitive music-distribution market. But most of Sirius' big costs are behind it. All that makes this company a cash-flow machine. And Sirius intends to put that cash to work to benefit investors. The key to executing these buybacks in a smart fashion is keeping enough cash to invest in content. Streaming music providers like Pandora are providing stiff competition on the music front. What's more, according to FBR Capital Markets, 64% of Sirius subscribers already use Pandora. Sirius has to maintain its biggest advantage: top-tier original programming. As cars continue to become Internet-connected, playing into the hands of Apple and Pandora, Sirius still has an advantage in that it has great original programming. It continues to expand on that front, and it needs to. It also needs cash to do so. Sirius is in a great position to buy back its stock, which would benefit long-term investors. However, buybacks need to be balanced with using its cash wisely, and continue to invest in its original content. So far, it looks like the company is poised to strike a healthy balance. Investors will want to keep their eye on how the company deploys its cash.